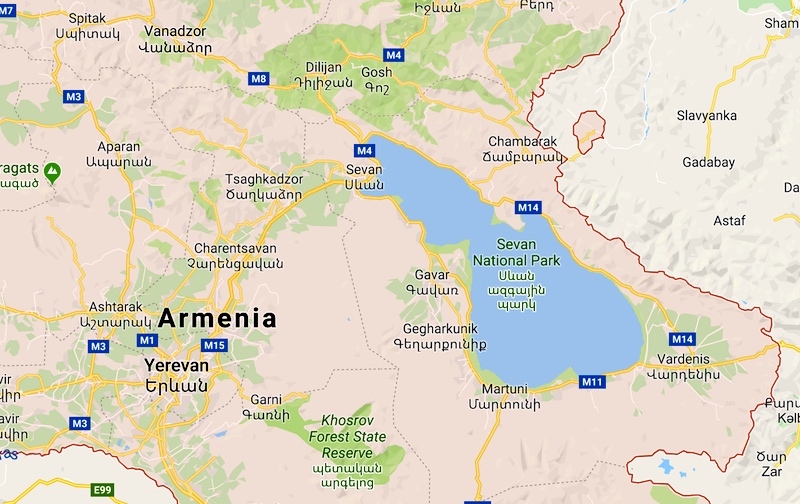 In Anthony Bourdain’s Parts Unknown S11 E4 “Armenia” (first aired 4/20/18), he travels from the capital, Yerevan, to Lake Sevan, which he characterizes as “the Switzerland of Armenia”. Ah, yet another (metaphorical) Switzerland, indeed yet another (snowclonic) Switzerland of X. In general, wherever you have alpine terrain, especially with snow, forests, lakes, and quaint villages, you have another Switzerland. (#1) Swissly picturesque spots: the towns of Sevan and Dilijan. On the right (east), Azerbaijan. In the bottom left: a corner of Turkey. Not shown on this map, but not far away: to the north, Georgia; and to the south, the enclave of the Nakhchivan Autonomous Republic of Azerbaijan, and Iran. 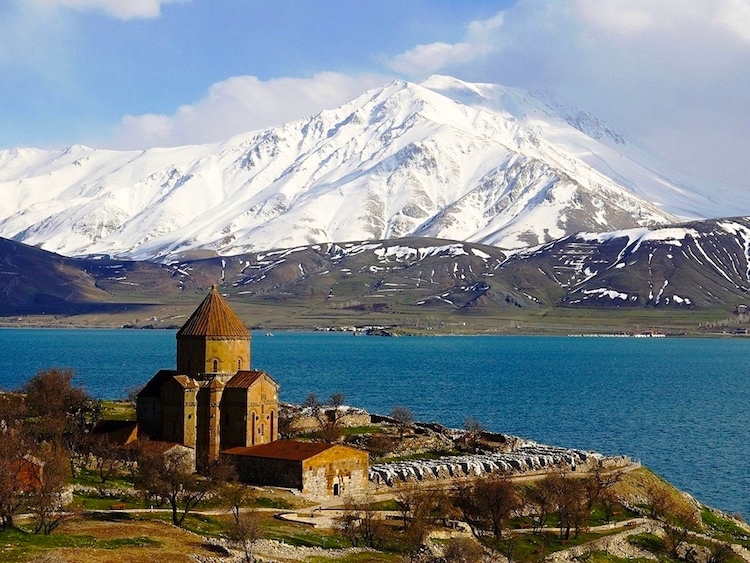 Sevan: Armenia might not have a sea, but it has a natural gem that is just as beautiful; namely Lake Sevan. Sevan is a beautiful destination located on the shores of the river. Situated 1905 meters [6250 ft] above sea level, Sevan is the perfect town to head to on hot summer days to take a fresh dip, and when the weather is not good enough to swim, you can still enjoy a delicious local fresh fish barbecue by the lake. The most popular sight of interest there is the monastery Sevanavank. This historic church is beautiful for the crude black stones which make up its exterior design and the stunning old altar located inside. It is also the best spot to enjoy stunning views of the vast lake. Dilijan: Dilijan is a major spa town in the province of Tavush, which is most famous for its mineral water curing fountains. A favorite destination among both locals and tourists, the green town offers quite a number of lovely hotels and sanatoriums, giving visitors the opportunity to take in the beauty of the surrounding National Park and the impressive historical sights. 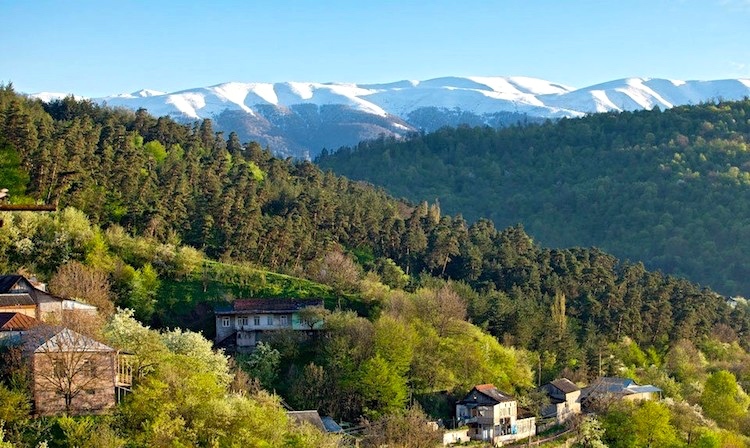 Locals sometimes refer to Dilijan as the ‘Little Switzerland’ or ‘Switzerland of Armenia.’ This beautiful forested town also boasts some traditional Armenian architecture, especially in the ‘old town,’ and is the perfect spot for mountain biking, hiking and even picnicking. It starts with the Alps, with Switzerland in the middle of them; these mountains then give a name to a characteristic terrain, found in many parts of the world. Actually occurring, and possibly meriting further postings: countries billed as the Switzerland of Africa; and places billed as the Switzerland of Canada, the Switzerland of Mexico, the Switzerland of Argentina, and the Switzerland of South Africa. At the time, I hadn’t contemplated the Switzerland of Armenia, but it makes perfect sense. Anthony Bourdain. Bourdain’s food and travel series on tv — some background on Bourdain and the series Parts Unknown in my 6/15/18 posting “Background foods and food discoveries” — went to places both familiar and exotic, enthusiastically celebrating food and drink, cooks, music and dancing, and people, especially ordinary working class people. The locales included those known for their food (like Berlin and Hong Kong) and places that had suffered natural disasters (like the Armenian earthquake of 1988), devastating conflicts, large-scale plundering (the Congo, West Virginia), and disruptive social change — and discovering there intriguing people and deeply satisfying food (over the whole range from poverty food, street food, and fast food to haute cuisine). Earthy, wry, profane, open, raucous, empathetic, thoughtful, and energetic, all in one package. This entry was posted on December 28, 2018 at 10:24 am and is filed under Metaphor, Movies and tv, Snowclones, Switzerland and Swiss things. You can follow any responses to this entry through the RSS 2.0 feed. You can leave a response, or trackback from your own site. On the last full day of our trip last June to Georgia (mostly) and Armenia, we had lunch overlooking Lake Sevan. It didn’t particularly make me think of Switzerland, but it is definitely beautiful.